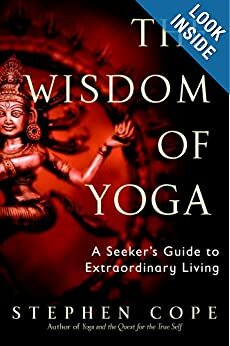 I am reading and delighting in Stephen Cope’s book The Wisdom of Yoga: A Seeker’s Guide to Extraordinary Living – a very warm, personal and et scholarly take on Patanjali’s Yoga Sutras. 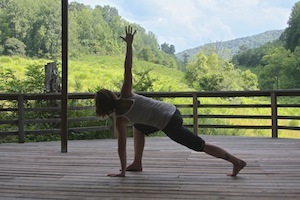 … When I moved down into Triangle Pose, I slowly turned my head upward to gaze along my outstretched, reaching left arm. Energy kicked in again, and I felt my body light up like one of those energy charts on the wall at my acupuncturist. I felt all the lines of energy from my left foot up through my spine, and then through the crown of my head, from my sternum up through my left arm and simultaneously down through my right arm which reached toward the ground. It was the reaching that did it, I think. Reaching up out of the center. Up toward heaven, down toward earth. With my heart and sternum open. And feeling my legs and abdomen so strong. I dropped my left shoulder slightly back, and this opened my sternum and heart even more. 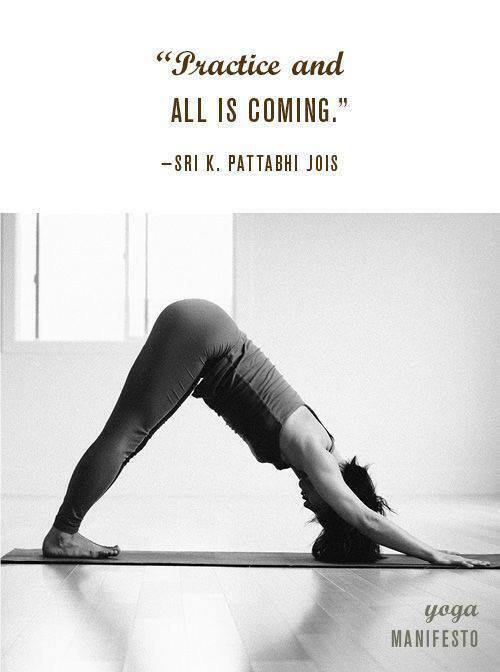 One of the reasons I love triangle pose is because of the deep stretch in my back. But the more important reason, I think, is because of the way it makes me feel. I love the feeling of grounding and rooting safely through the legs while flying my arm upward and opening my heart to the experience. I love the expansiveness of this pose – it helps me grow in all directions, while keeping a safe, strong, and grounded center. I have very rarely had the experience of feeling the energy signature of a pose. It requires being very still and present, and all of a sudden, there is more to a pose than muscle and effort – there is a signature emotional state and a precise meaning that eludes my words, however. I am not saying that we should practice asana looking for and hoping for these extraordinary experiences. I am just saying that we should be open to the possibility that they might happen. And that the stretch of a limb might be much more than that – it might be moving energy in that direction. Have you had any experience of energy while practicing asana? Please share! Triangle pose description and instructions from Greenville Yoga and from Yoga Journal (the latter with video). 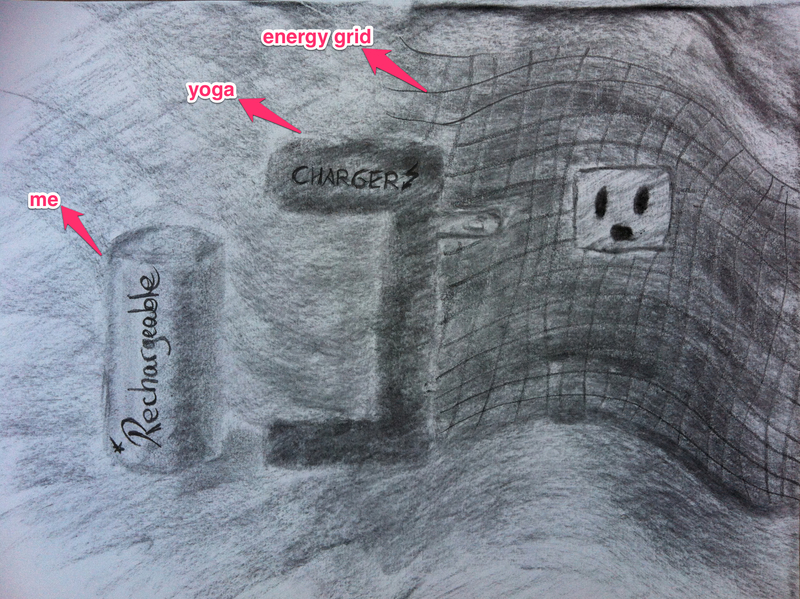 Nice reminder that all it takes to regain energy is just regular practice. to guide the flow of energy into the body. Here, energy is conceptualized in the Chinese Yin/Yang system. The Earth DVD includes predominantly standing sequences – lots of warriors, tree, horse (temple), chair poses with barely any counterposes. The poses are supposed to help you draw Earth energy into the belly (a chi energy center). I found that the sequence didn’t progress smoothly – no warm-up, no cool-down. It was not paced like a typical yoga class. I was fairly tired at the end of the day and I did not keep up with all the standing asanas. I did like, though, that all movement was slow and coordinated with the breath. As I lay in Shavasana at the end, I felt a monstrous stomach ache creeping in. I do get heartburn now and then, so I cannot make casual attributions here, but I’ll just say that, unlike most yoga classes, this one did not make me feel any better afterwards. One Zantac, two Pepto Bismol, two hours and a ginger tea later, I wonder: Why is it necessary to innovate yoga? Why merge it with the Chinese energy system when yoga is already very tightly associated with another ancient healing system, Ayurveda? How do we know that this innovative energy work we’re doing here is not harmful? How and why did it come about? How do we know what we’re even doing here? It takes tremendous intuition, perception of energy flow and experimentation to figure out what we’re even doing. Honestly, Sarah Powers looks too young to have had the time to do all this in her lifetime (this one, at least). What if it was not Earth energy that I needed right now – or ever? I have a strong kapha dosha (the Ayurvedic equivalent of Earth) – did I just aggravate it? When I read “balancing” Earth energy I interpreted this in the Ayurvedic sense, which means compensating with the opposite. I am not sure what I just did… Ayurveda teaches how to identify what your system needs at any given time, depending on disposition and season. It then teaches how to balance energies with their opposites. This can be done through a combination of diet, asana, herbs, etc. I think I might have just taken a pill without a prior diagnosis to determine whether I even needed it and now I’m dealing with the side effects. 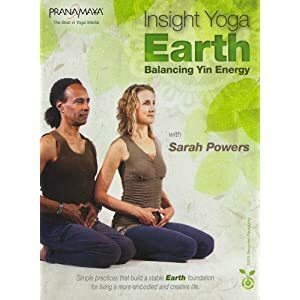 Most likely, there’s more to insight yoga than I can glean from this DVD, but so far, I think I’ll stick with traditional yoga and Ayurveda before buying into innovative hybrid styles.